SEE A FLASHED VERSION IN THE WS TOO! 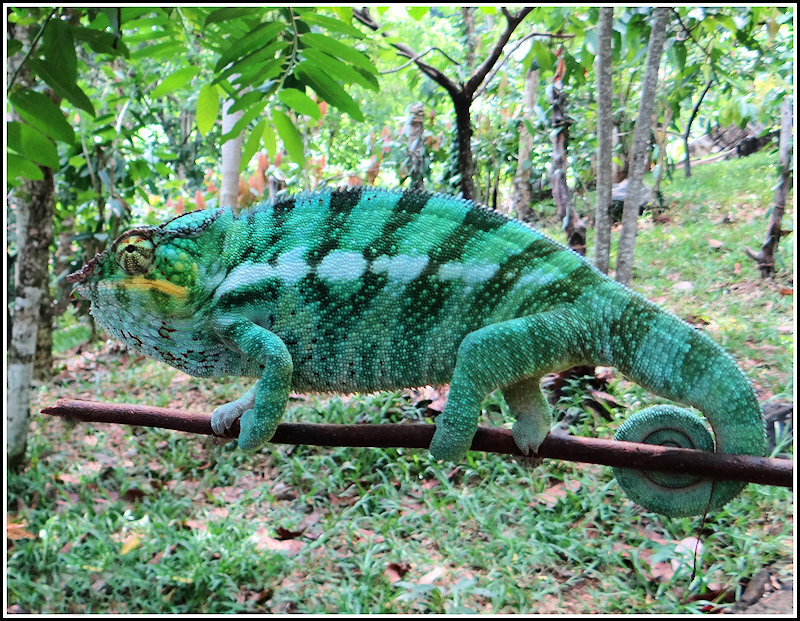 After butterflies and moths, the time has come to change genre, among the beauties of Madagascar there are certainly the chameleons, and I start with the first, the most famous and certainly the most beautiful. The panther chameleon (Furcifer pardalis) is a species of chameleon found in the eastern and northern parts of Madagascar in a tropical forest biome. Additionally, it has been introduced to Réunion and Mauritius. Male panther chameleons can grow up to 20 centimetres (7.9 in) in length, panther chameleons have a typical length of around 17 centimetres (6.7 in). Females are smaller, at about half the size. In a form of sexual dimorphism, males are more vibrantly colored than the females. Coloration varies with location, and the different color patterns of panther chameleons are commonly referred to as 'locales', which are named after the geographical location in which they are found. Panther chameleons from the areas of Nosy Be, Ankify, and Ambanja are typically a vibrant blue, while those from Ambilobe, Antsiranana, and Sambava are red, green or orange. The areas of Maroantsetra and Tamatave yield primarily red specimens. Numerous other color phases, and patterns occur between and within regions. Females generally remain tan and brown with hints of pink, peach, or bright orange, no matter where they are found, but there are slight differences in patterns and colors among the different color phases. Oher info on wikipedia. I never have the chance to shoot chameleons.....The colors and details are stunning. گرگٹ named in local language, in many saying or quotations it is used that it change colour according to environment, an excellent frame and shot. This is the most impressive item of your collection from Madagascar, Luciano. Beautiful photo of this chameleon in fine sharpness and natural colours. The Bg is a bit disturbing. Therefore I like the workshopversion too. Beautiful Chameleon, no doubt. Excellent colour and details. Well presentation of this rare guest. But background, too disturbing for viewers. Very difficult to concentrate on Chameleon. Moreover, too tight frame, it's face is almost touching the frame. I like its color, sharpness and every thing in the picture! I also like the one in the workshop! Congratulation and thank you for sharing it! Les branches cadrent bien l'animal. La prise de vue permet de voir les détails du Caméléon panthère. La lumière rehausse la beauté des couleurs. Bonne journée. Waauw, this looks like a surrealistic animal. I gues you seen a lot of strange animals in Madagascar. Look also at the way it keeps it's balance on the small branch.